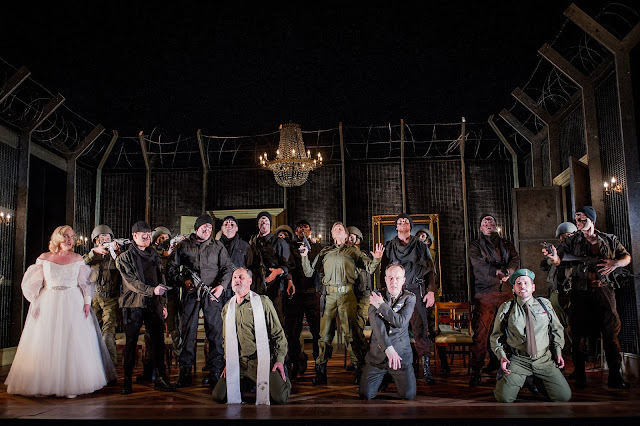 The second Buxton Festival opera production this year was Bellini's I Capuleti e i Montecchi, not strictly Shakespearian but an alternative take on the familiar story and very apt for this Shakespeare anniversary year. Harry Fehr's production opened at Buxton Opera House on Saturday 9 July 2016, designed by Yannis Thavoris with lighting by Simon Corder. Sarah-Jane Brandon was Giulietta, Stephanie Marshall was Romeo, Luis Gomes was Tebaldo, Julian Tovey was Lorenzo and Jonathan Best as Capellio. Justin Doyle conducted the Northern Chamber Orchestra. Bellini's opera is far more compact than the familiar Shakespeare play. Written at short notice for Teatro La Fenice in Venice in 1830, Giulio Romani's libretto was based on the one he had written on the same subject for the composer Vaccai, and because of shortness of time a minimum of scenes was used. This means that the opera pacier than the play, and concentrates far more on the two lovers. 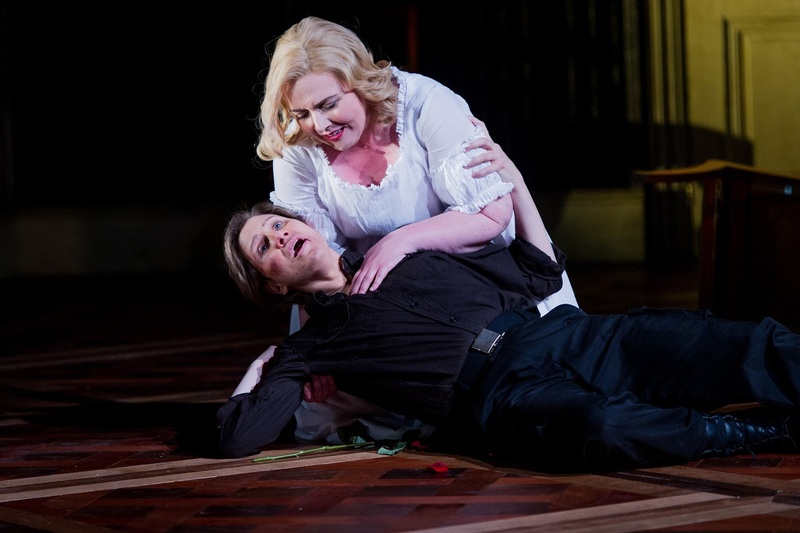 Harry Fehr and Yannis Thavoris emphasised this by using the same setting for all five scenes, something that works well in this opera and contributed to the pace by removing the picturesque element. In the pre-concert talk Fehr and Thavoris had talked about how they wanted the design to reflect both contemporary themes and the period of composition, so the setting was essentially and 1830's room, the sala grande in Capellio's palazzo, yet rather strikingly the walls were in fact a barbed wire fence. Costumes were basic modern combat gear, but Giulietta's dresses reflected 1830's styles. Combat gear can be a good disguise for making women look less feminine when playing men, and Stephanie Marshall was strikingly lithe and androgynous. Fehr also took advantage of the fact that the score calls for an off-stage women's chorus in the last act, to use the female chorus as supers, dressed as men, so that there were a creditable number of Capulets and Montagues on stage despite only having a chorus of eight men at his disposal. The production was essentially naturalistic, with Paul Benzing as fight director, but Fehr's skill was to make this work within the context of Bellini's essentially non-naturalistic musical structures. During the pre-concert talk we had also been informed that rather admirably all the cabalettas had their repeats, so that the only cuts were a couple of small ones in the Tebaldo Romeo duet towards the end of Act Two. Yet Fehr made these two work together admirably, so that you never felt that action impeded the music, nor that there was an element of vamp till ready in the action. Perhaps the production lacked that element of moonlit drama which Pierluigi Pizzi brought to his classic production at Covent Garden, but overall Harry Fehr created a pacy drama, which still allowed the music to breathe. It helped that he had a trio of young, talented principals all of whom were able to combine Bellinian style with strong drama. This was even to the extent of Luis Gomes (Tebaldo) and Stephanie Marshall (Romeo) fighting during their cabaletta. Marshall was an energetic, vibrant and rather sparky Romeo, with a temper that was always quick to rise. Her voice is lithe, rather than refulgent, which worked well in this smaller theatre and convincingly helped define Romeo's character. Her sense of style in the arias and duets was striking, with a lovely sense of Bellini's long breathed melodies. Yet, this was vibrant drama, demonstrating quite how vividly dramatic Bellini's music can be when sung well. She brought heartbreak too, and the whole of Romeo's final scene was powerfully moving. The duet with Luis Gomes equally impressive Tebaldo had just the right element of two young men jostling and preening, whilst the closing scene with Sarah Jane Brandon's Giulietta combined an element of dramatic realism in Romeo's death with some gut-wrenching singing. Sarah Jane Brandon was a poised and stylish Giulietta, both looking and sounding striking. 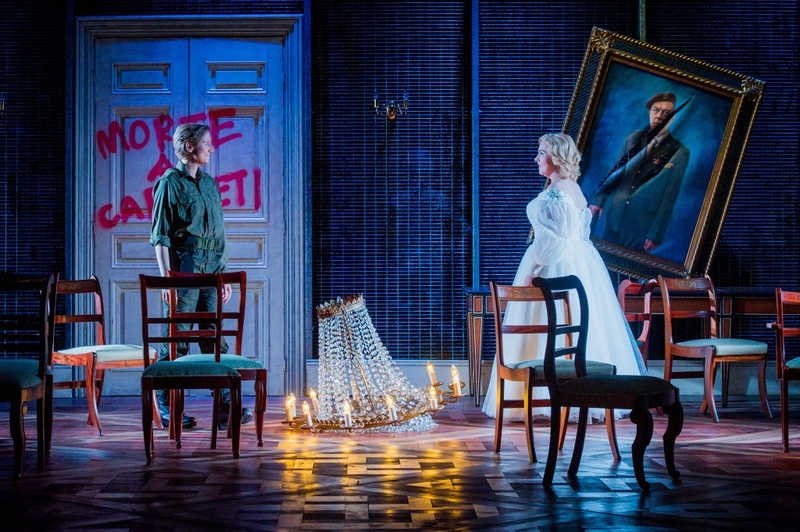 But this was no little-girl Giulietta, Brandon's voice had a strength to it which added to the interest, particularly in the powerful Act One duet when Marshall's Romeo tried to persuade Brandon's Giulietta to flee and she refuses partly from her sense of honour. This Giulietta really made that moment tell. Brandon's voice was quite powerful, yet she could turn on a pin and produce magically quiet phrases. Her tone quality was wonderfully even throughout the voice, and like the rest of the cast she had a strong sense of Bellini's style, producing long-breathed phrases, yet being finely moving. She and Marshall created a powerful tension between the two characters and really made the final duet work. That the staging meant that Brandon spent the first half of the scene encased in Giulietta's coffin made it all the more impressive. Luis Gomes made a powerful Tebaldo, giving a strong performance yet using his vibrant voice with a good sense of style. I have mainly seen Gomes in later repertoire, and it was good to hear his confident performance in Bellini and it set me thinking about other bel canto roles which might suit. Though not completely a leading character, Tebaldo's music is no easy ride and Gomes was stunning and thrilling in his Act One aria, and as I have said duetted vibrantly with Marshall's Romeo in Act Two, yet he also created a believable sense that Tebaldo was in love with Giulietta. Jonathan Best was a wonderfully grim and severe Capellio, making the character's monomaniacal focus on revenge really work, yet singing Bellini without distorting the music for emphasis. Julian Tovey was a highly sympathetic Lorenzo, here a priest (as in Shakespeare) rather than a doctor. The chorus had to work hard, with both groups (men and women) changing clothing to alternately represent Capulets and Montagues. The eight men produced some strongly vibrant singing and in this theatre never made you feel that they were underpowered. Both groups brought a strong dramatic sense to their portrayal of the two different groups, whom Thavoris had dressed in very different colours and styles, so we were always clear who was whom. In the pit Justin Doyle drew a lithe performance from the Northern Chamber Orchestra. Bellini's score is nowhere near as complex as that of Beethoven for the previous night's Leonore, but it still requires a sympathetic hand to ensure that Bellini's orchestral colours come through and that the rather basic rhythmic shapes that he uses in the accompaniment are fluid and not driven. This was quite a speedily dramatic performance, but one with enough flexibility to allow the music to flow. This wasn't a production full of swords and elegant renaissance outfits, but it was sympathetic to Bellini and Romani's drama, and you never felt that Fehr and Thavoris were trying to pull the piece out of shape. And despite the modernisms, the production had its own real sense of elegance. But the opera really stands or falls by its principals, and the three young leads, supported by an excellent ensemble, really made the drama a personal one.